Today, 13th April, marks the 260th anniversary of the first performance in Dublin of Handel's Messiah. That day was also a Friday but it was not Good Friday, as some have suggested, Easter having fallen three weeks earlier that year. The myth that the première took place on Good Friday is only one of the many myths that have built up around the Messiah, and my desk diary (which, I have to confess, was what reminded me about this auspicious day) propagates yet another. Audiences in the UK traditionally stand while the "Hallelujah" Chorus is being sung. I have always considered this a daft and irritating habit and have tried to stamp it out whenever I have directed a performance. But it's one of those things that audiences do, and I doubt anyone will ever be able to stop them. I notice the habit has even spread so that performances way beyond the borders of Britain suffer the same mass interruption. Why do they do it? Well the myth is that at a performance in London, King George II stood up at this point in the performance and the entire audience followed suit. The fact that the King appears not to have been even there when, at the performance on 15th May 1750, an audience first stood is conveniently overlooked, and the legend has grown that he stood because he thought the words referred to him. That is arrant nonsense. For a start, the words come from The Bible and, despite his limited knowledge of English, if King George recognised the words at all, he would have known their context. The story that he stood up because he found the music so exciting is equally ridiculous; Kings just do not do that sort of thing. I much prefer the (equally unsubstantiated) anecdotes that he stood up because he thought it was the final number and was anxious to get out of the theatre after having sat through over two hours worth of music, that he stood up because he was so bored with the music, he couldn't stand any more, and that he stood up because he needed to go to the lavatory. I've often used one or other of these stories in my programme notes for the work in a bid to get audiences to see the idiocy of standing up, but all to no avail. When there's a good myth about, why look for logic? 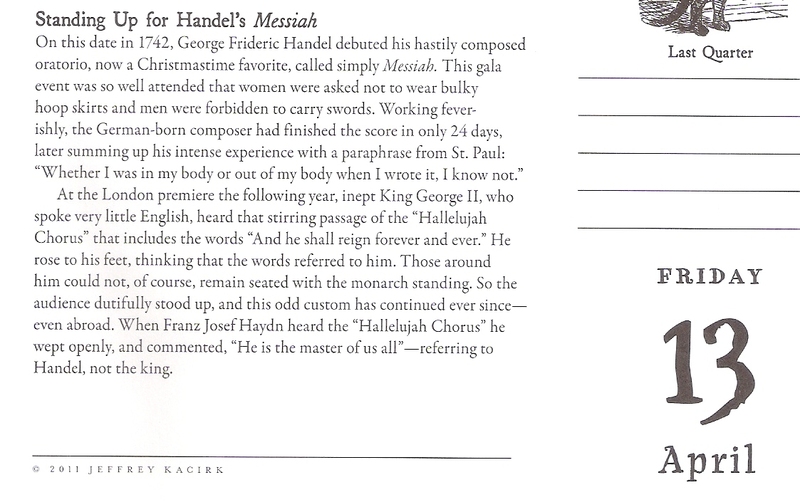 Not quite myth, but equally contentious, is the practice of performing Messiah with minimal forces. 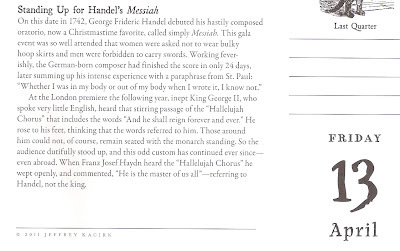 Some 19th century performances with several thousand participants may have taken things too far, but I'm sure Handel would not really have liked the kind of introspective, desiccated performances so many come up with today in the misguided pursuit of "authenticity". The most recent recording, from the Cleveland-based Apollo's Fire, continued this trend and I'm afraid my review of it in last month's International Record Review was far from enthusiastic. 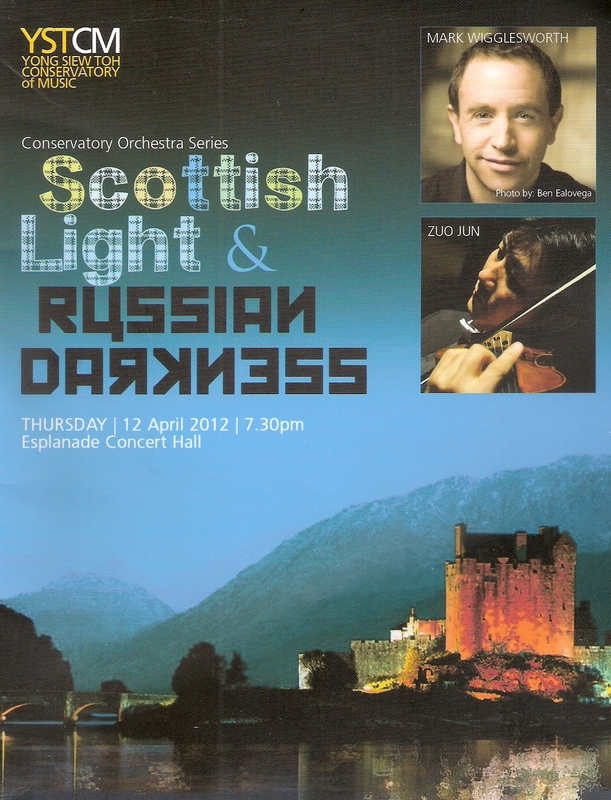 There are countless other musical myths floating around which, in the absence of hard facts to disprove them, continue to fly against all logic, and I was sorry to see my eminent colleague at Yong Siew Toh Conservatory, Craig de Wilde, peddle another of these in his programme notes for yesterday's orchestral concert which featured Tchaikovsky's Sixth Symphony. With Tchaikovsky dying so suddenly while at the peak of his powers and reputation, speculation has long raged over the exact manner of his death. Craig revisited that myth first put about by Tchaikovsky's brother, Modest, that the composer had "drunk a glass of unboiled water during the savage cholera epidemic of that year, quickly fell dangerously ill, and died 4 days later". Although pretty conclusively discredited, not least by medical experts who have undertaken research into the symptoms of ill-health in the medical records of Tchaikovsky's last days, this story was for years an accepted truth, but too much evidence to counter it has surfaced in the past 50 years or so, not least the suggestion that his death seems to have shown far more the symptoms of arsenical poisoning. For my part I am almost convinced by the theory, first expounded in 1980 the Russian musicologist, Aleksandra Orlova, that he was forced to commit suicide when a letter making allegations about a homosexual relationship between him and a nephew of the Tsar was about to be handed to the Tsar. Pianist Stephen Hough was pretty robust in his refusal to accept this when he wrote his own notes for a performance of a Tchaikovsky Piano Concerto at the Proms a few years back, but most agreed he was merely trying to downplay the homophobic undercurrents in that prognosis, and few have really supported the "drinking unboiled water" theory in recent times. Does it matter? Well, apart from the personal tragedy involved, it does have implications for the interpretation of the Sixth Symphony. It has always puzzled musicologists that Tchaikovsky chose to end this work with a subdued and emotionally-charged finale, and the fact that he died within a week of the Symphony's first performance, has led to the suggestion that Tchaikovsky knew of his impending death; which puts the cholera story out of the running and barely adds any more weight to the self-admixture arsenic one - the existence of the notorious letter was, apparently, only made known to Tchaikovsky after he had written the Symphony. But, while there were precedents for ending a Symphony in a subdued manner (I suppose you could say Haydn's "Farewell" was the first), no clear explanation has really been made for this one, especially in the wake of the almost frighteningly up-beat mood of the third movement. 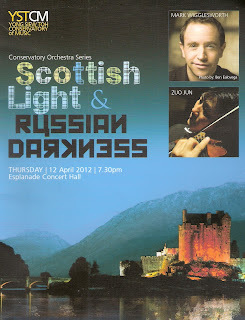 But I had a moment of blinding revelation at last night's concert when conductor Mark Wigglesworth side-stepped any emotional weight in the music by pushing through it in a brisk, business-like manner. Suddenly it made total sense; this was Tchaikovsky's homage to Parsifal. It had never struck me before just how closely related to Wagner's last great opera the main themes and the musical language of the Symphony's finale are. Now the speculation starts up all over again. Had Tchaikovsky recently come across Parsifal and had his mind full of its music? Did he feel his own music was seeking its own Holy Grail? Did he want to replicate the finality of Wagner's final major utterance? I've got a lot of researching to do over the next few weeks to see if this new vision of mine stands up as more than just another potential musical myth.